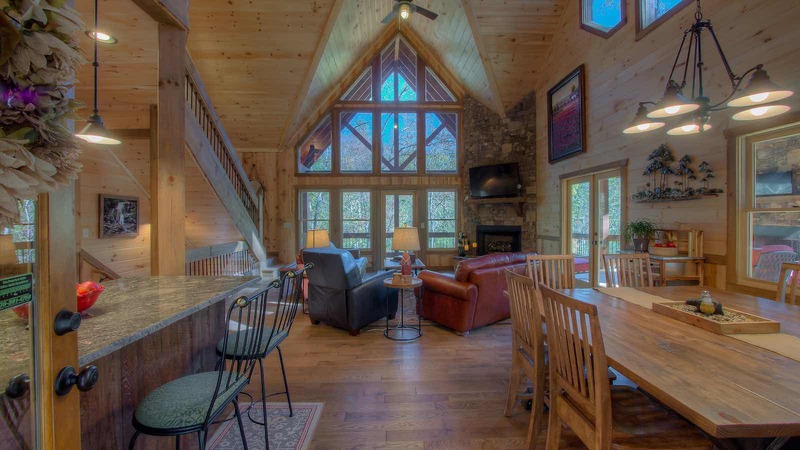 Living Waters is mountain living at its finest! 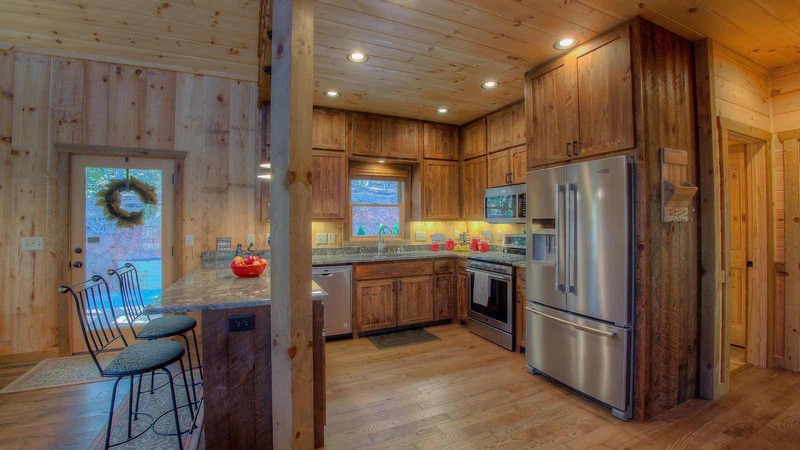 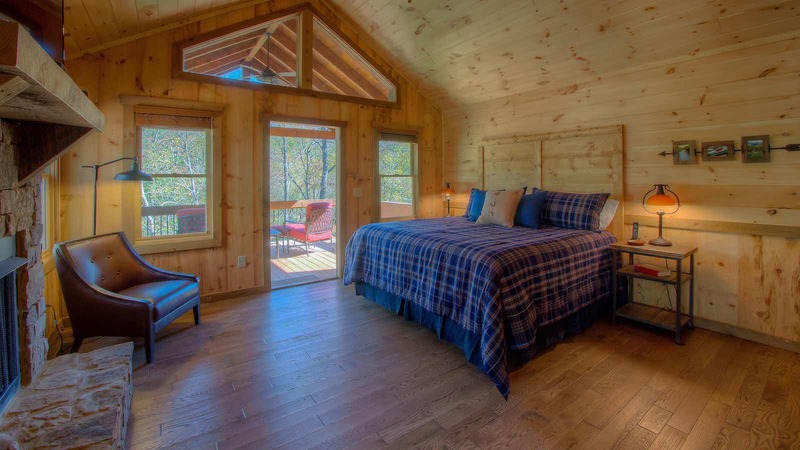 This is a newly built (2017) and custom designed stunningly unique cabin. 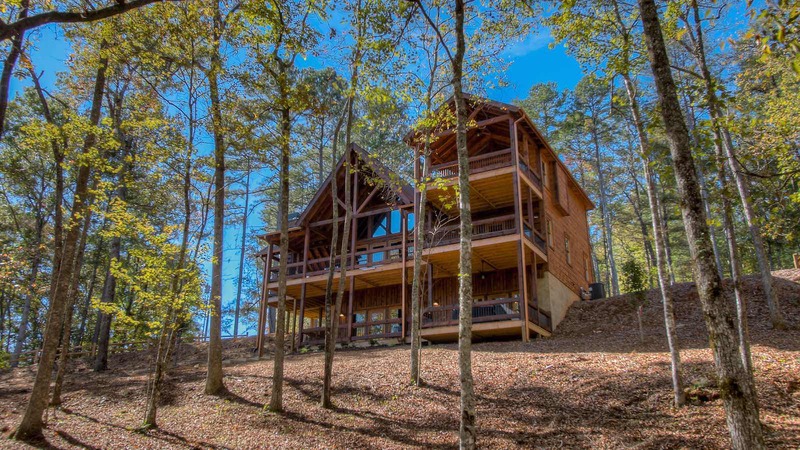 Living Waters is so special and will definitely capture your heart! 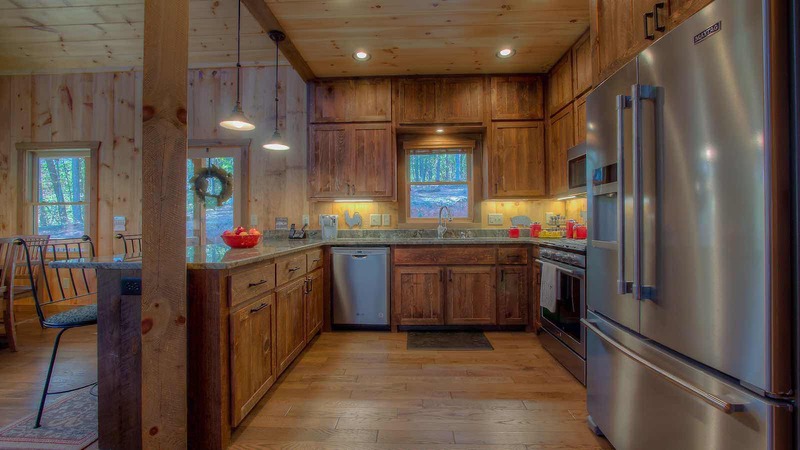 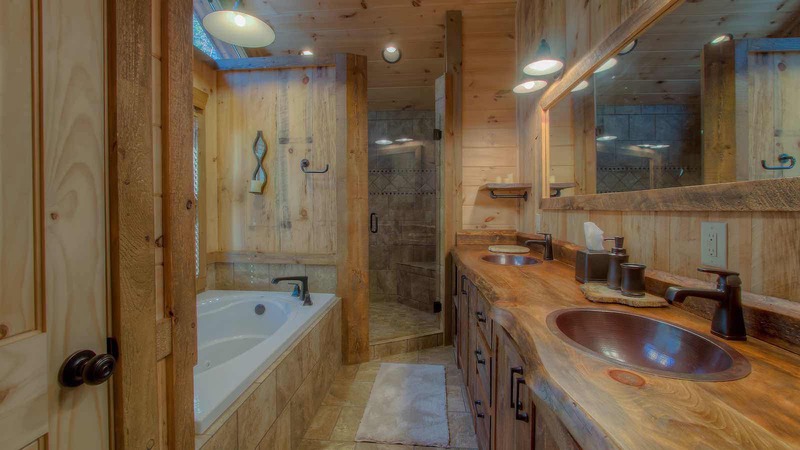 The cabin is perched on a small hill just above the highly coveted tributary, called Fightingtown Creek. 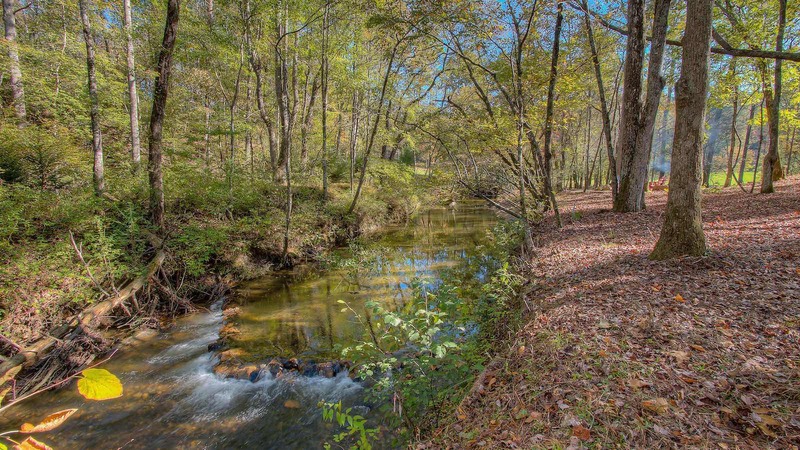 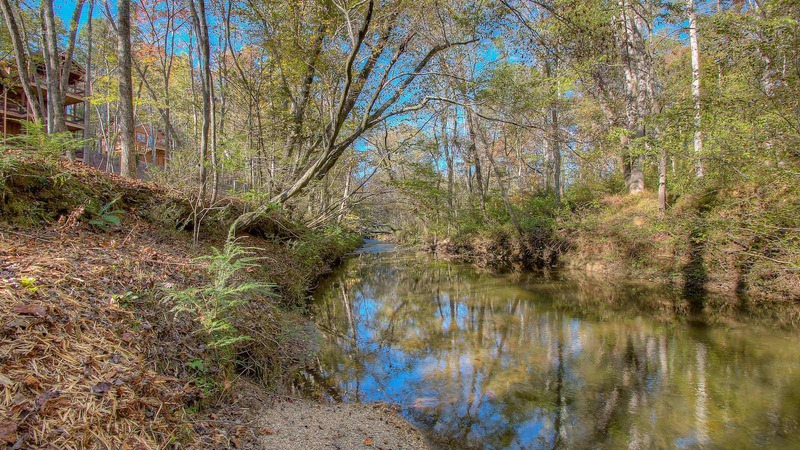 This famous stream is one of our areas most sought after water frontages. 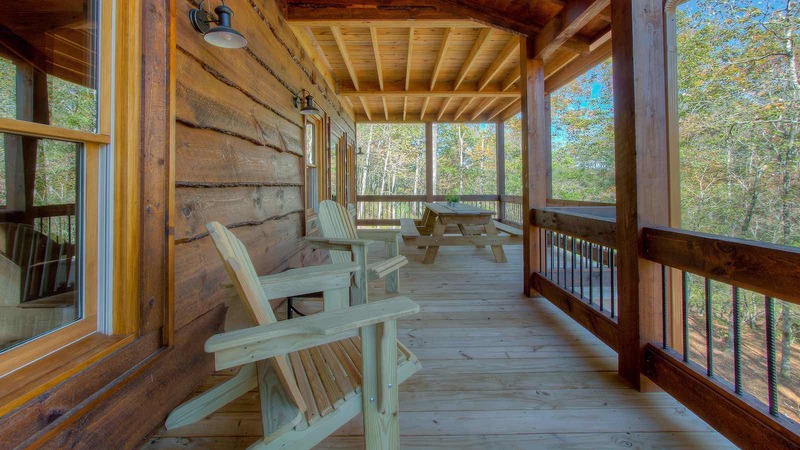 The main cabin and the guest house both overlook the 500 ft. of pristine water frontage! 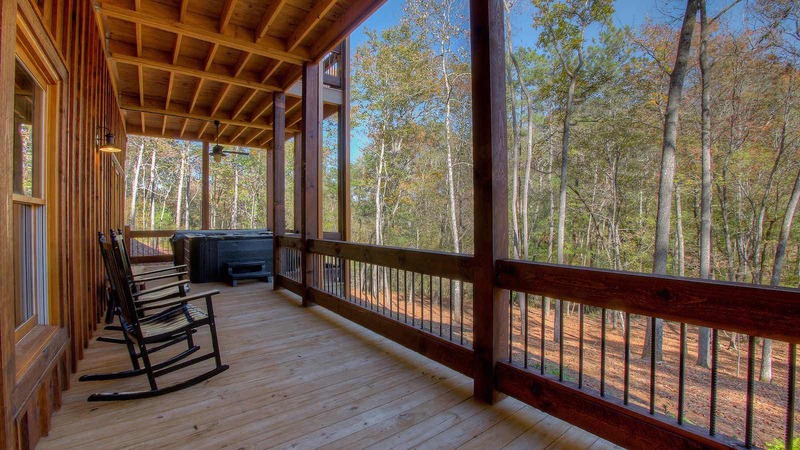 When you walk into Living Waters you will first notice the huge wall of glass that faces the creek and looks out over the park-like setting. 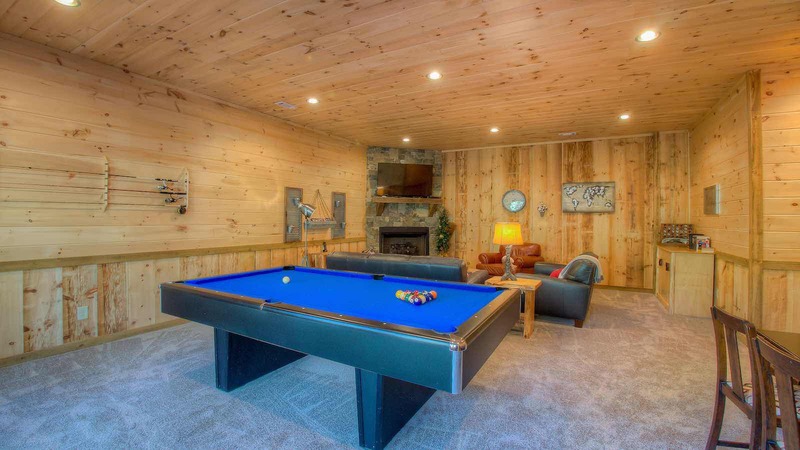 The great room has an 8-person dining table and a gorgeous kitchen with granite counter tops, stainless appliances and all the cookware and plenty of dinnerware. 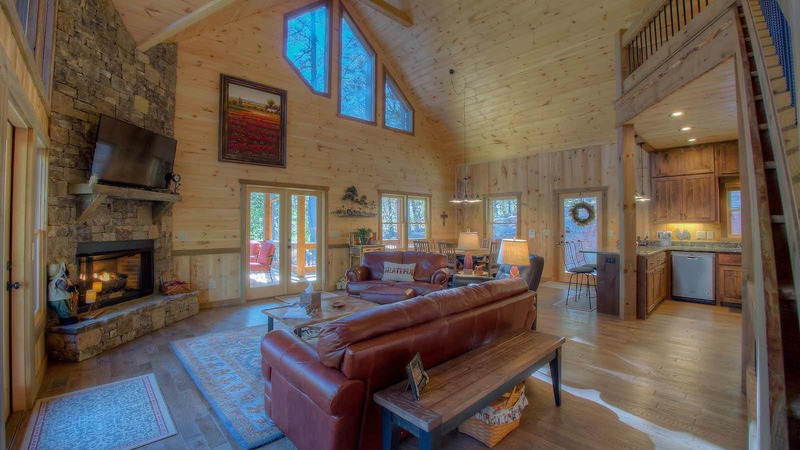 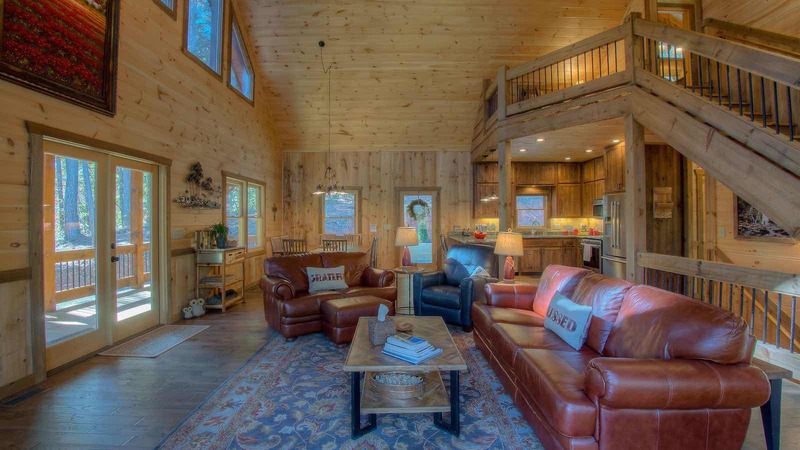 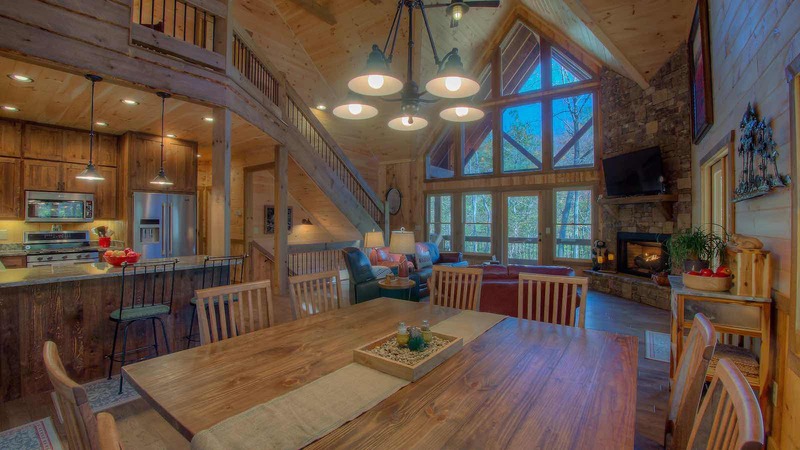 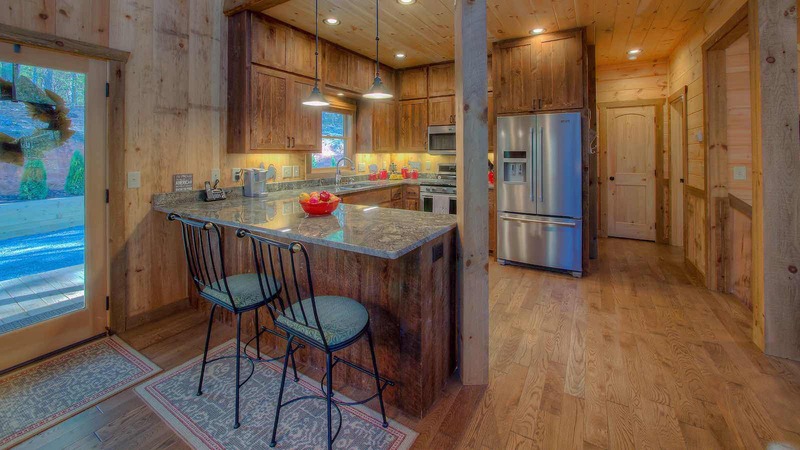 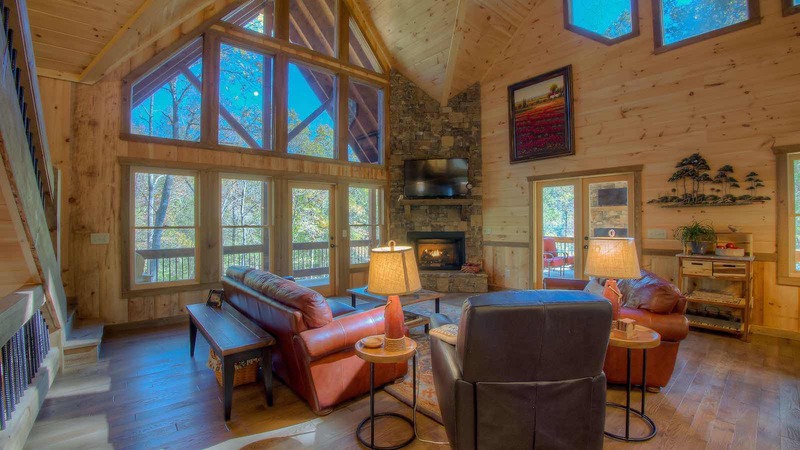 You will also find comfy leather furniture and a stone fireplace with gas logs in the living area. 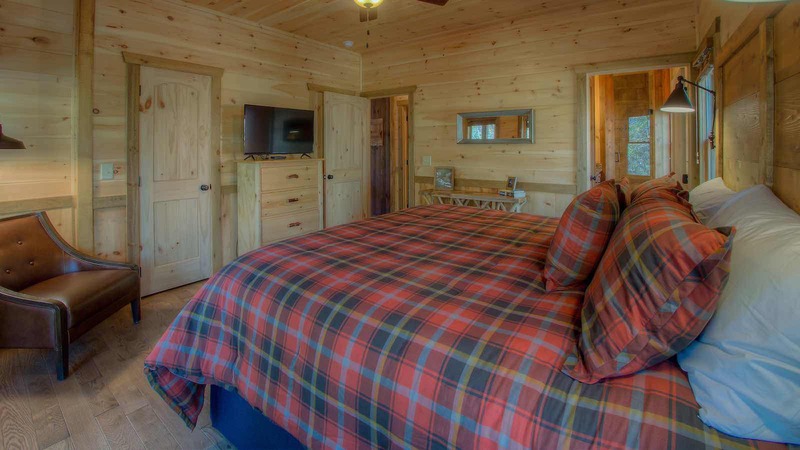 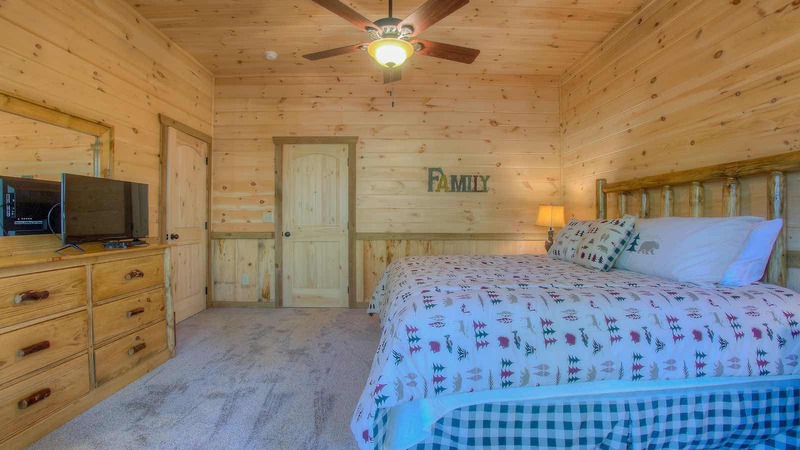 This level has one of the two master bedrooms with a king-sized bed and private bath. 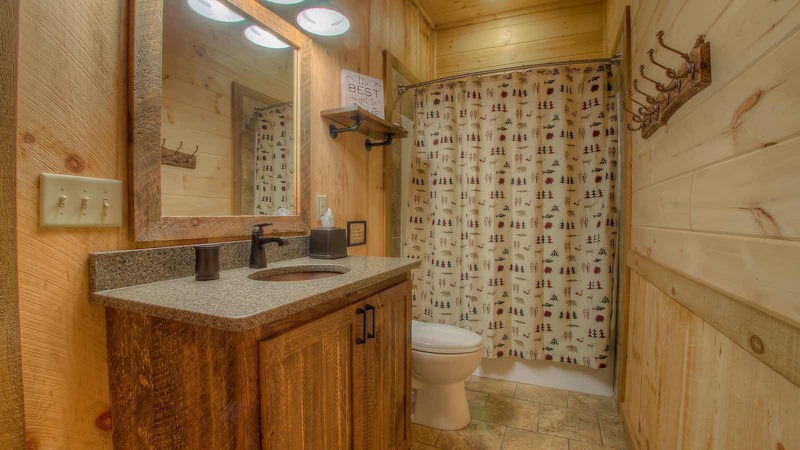 The laundry room & ½ bath is conveniently located just off kitchen. 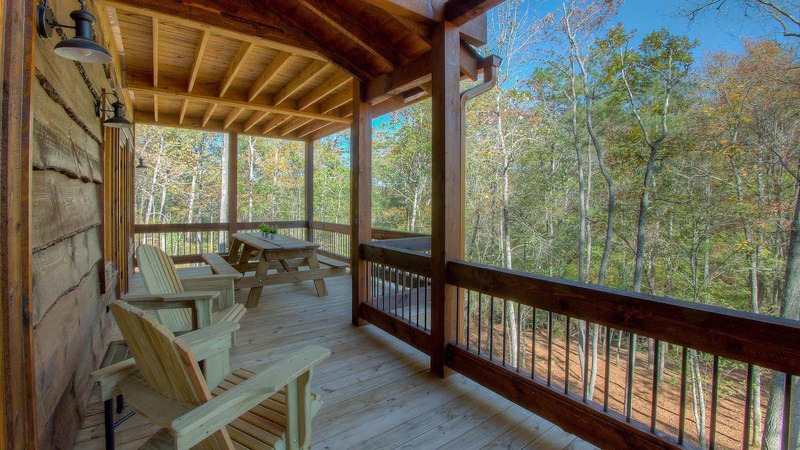 The wrap around porch on the main level features an outdoor living space with a wood-burning fireplace and cushioned seating. 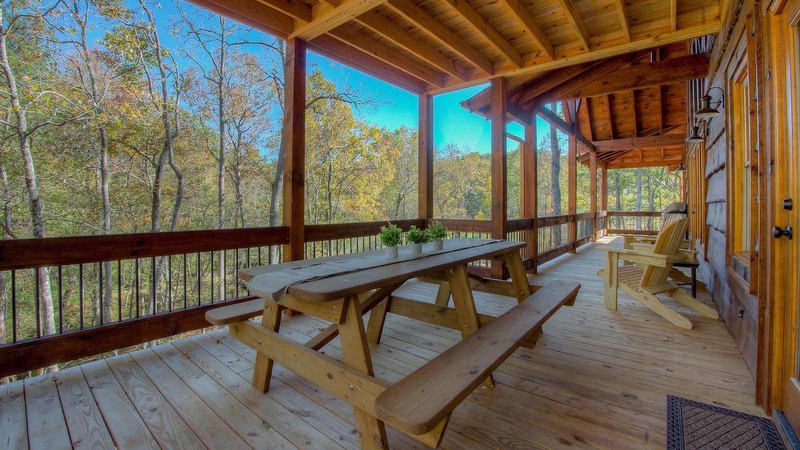 The grill and pic-nic table are also found the main level porch overlooking the creek. 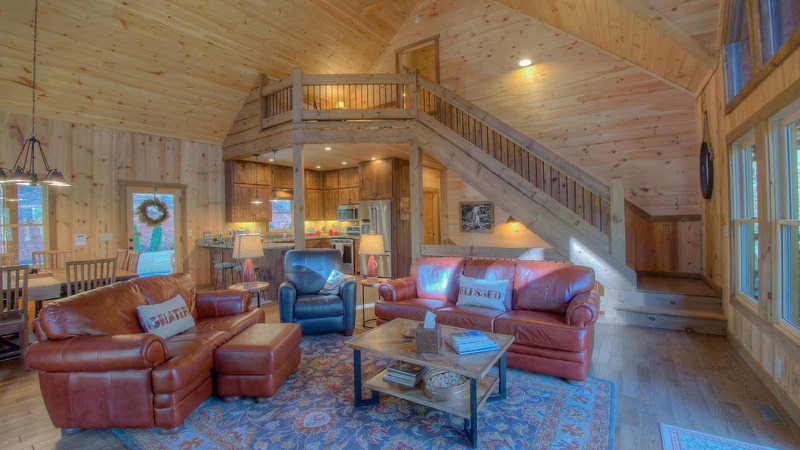 The upper level is truly luxurious! 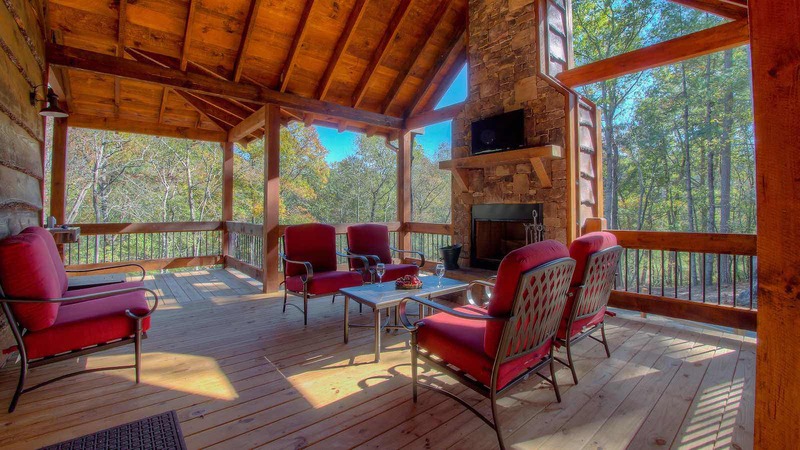 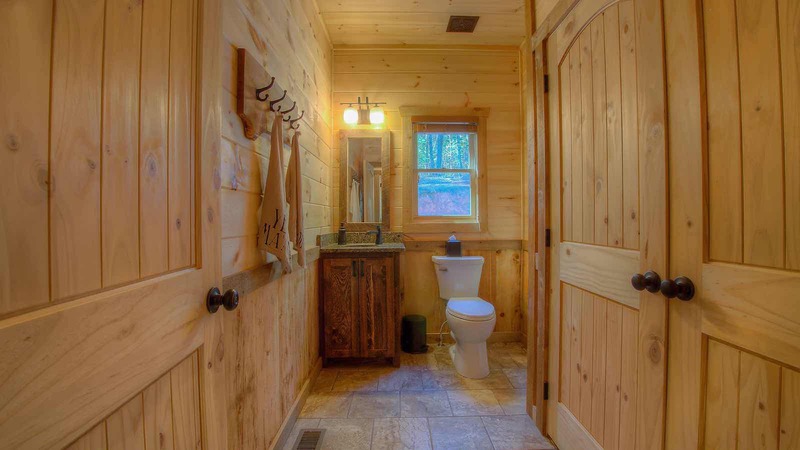 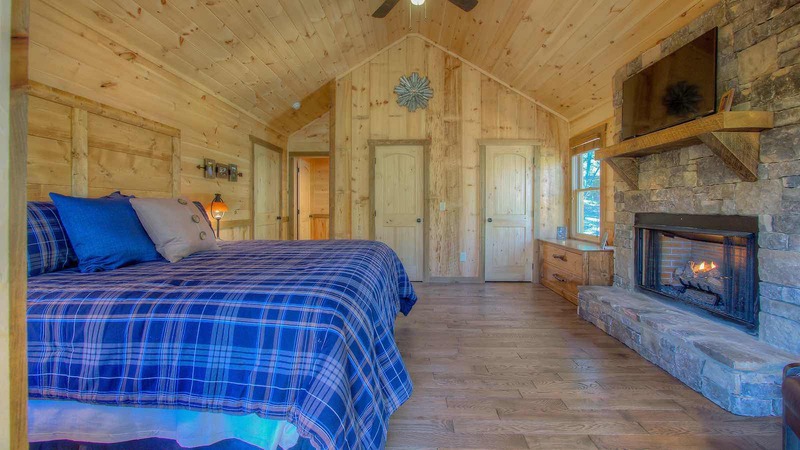 This level has a cozy reading loft, second master bedroom with king bed, private covered porch overlooking the beautiful scenery, a stone gas log fireplace and master bath with garden tub. 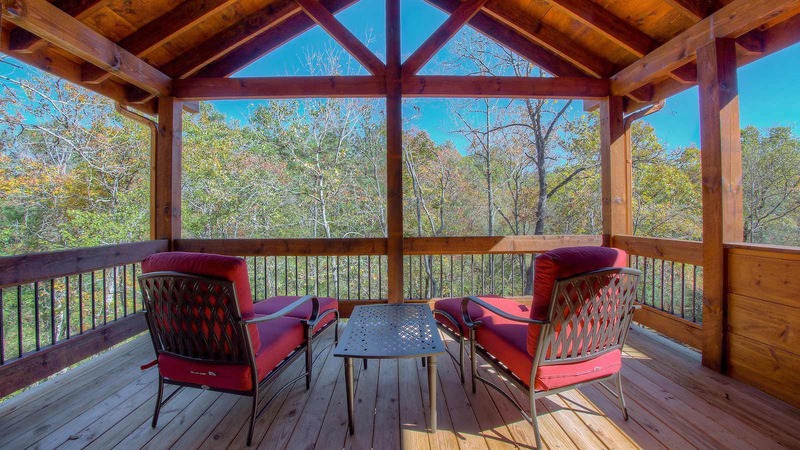 This is a perfect place to relax and recharge with your favorite person (or just have some “me” time!) 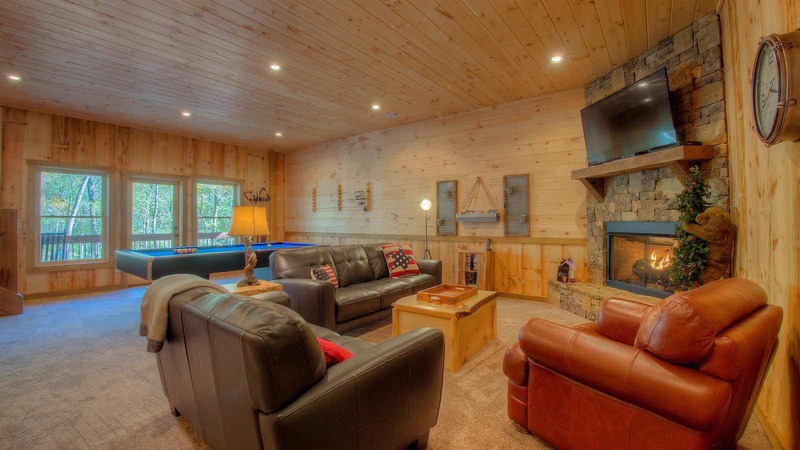 before dinner with family or friend’s downstairs. 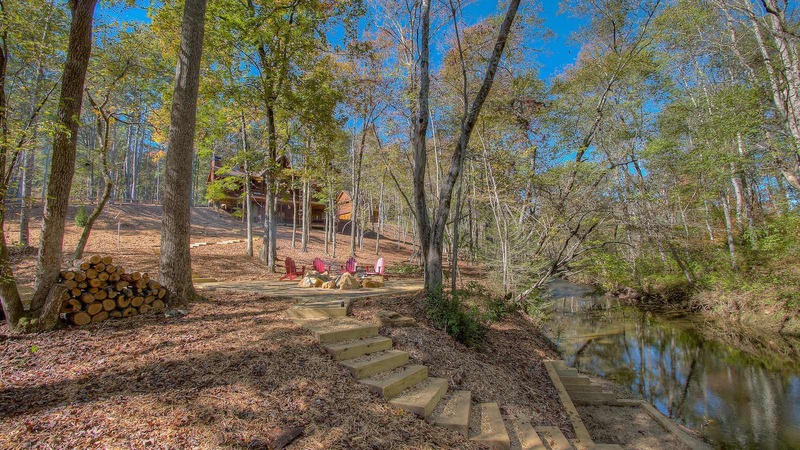 Or, skip dinner and spend the evening here watching the creek roll by with a glass of wine in hand! 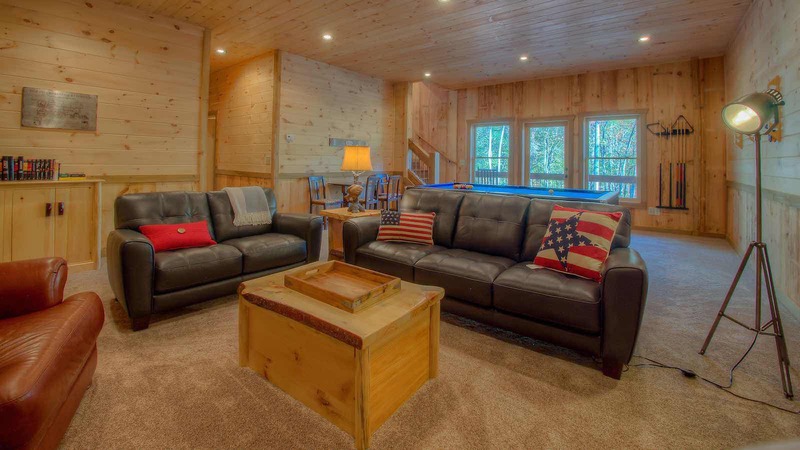 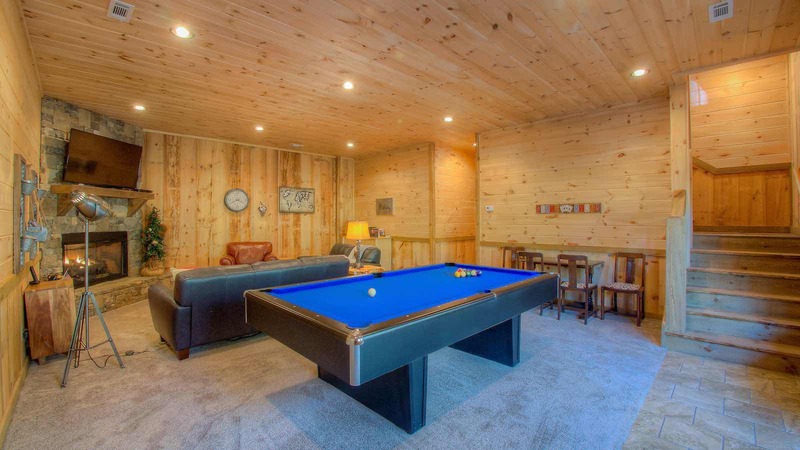 The basement level has a plush gameroom with a pool table, stone fireplace with gas logs, living area with TV. 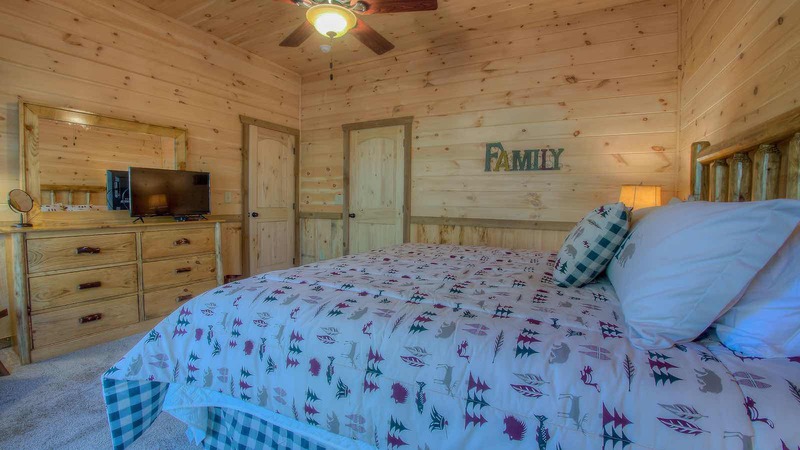 This level has two bedrooms: One bedroom with king bed and TV and One bedroom with bunk beds (twin on top and full on bottom) – these two rooms share a bathroom. 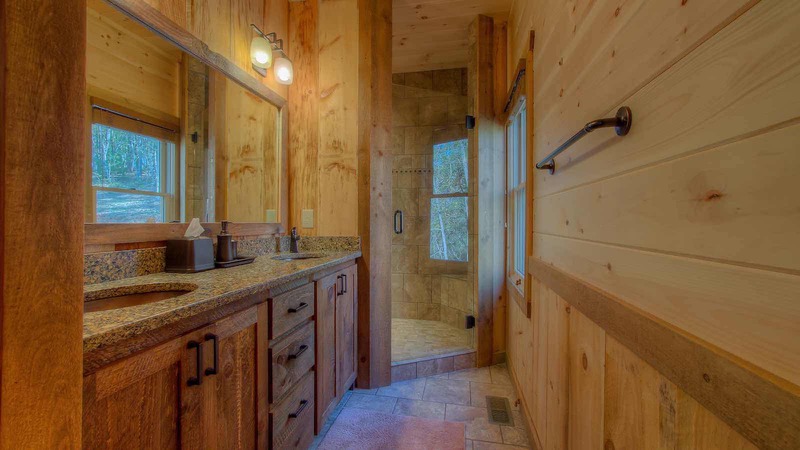 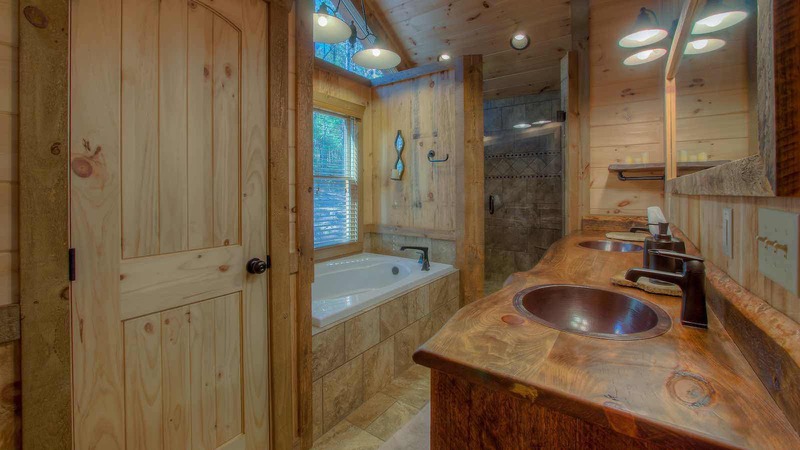 This bathroom has a single vanity with a tile shower/tub combo. 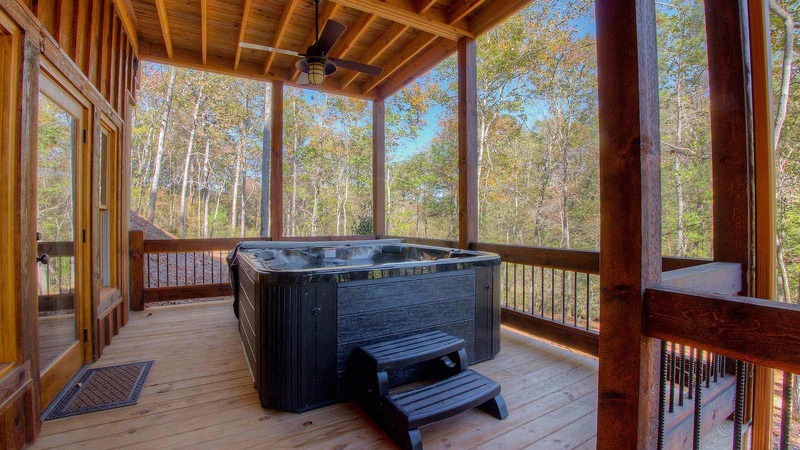 The hot tub is just outside this level and you will find steps all the way to the creek where the fire pit is located and steps to creek access. 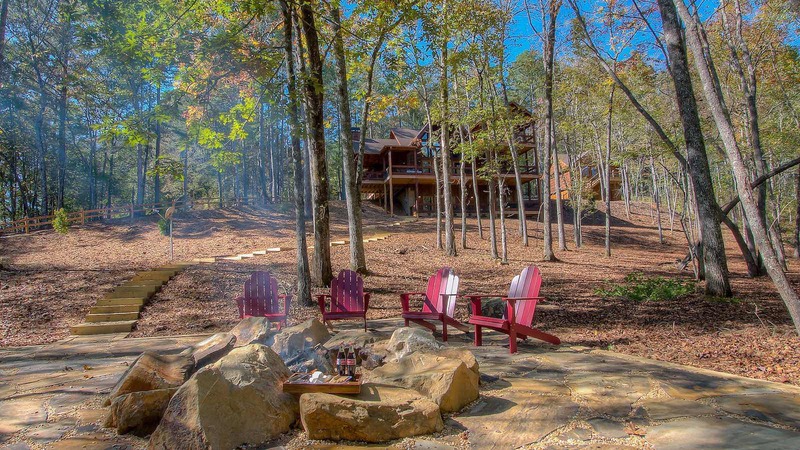 This is definitely the firepit of your dreams! 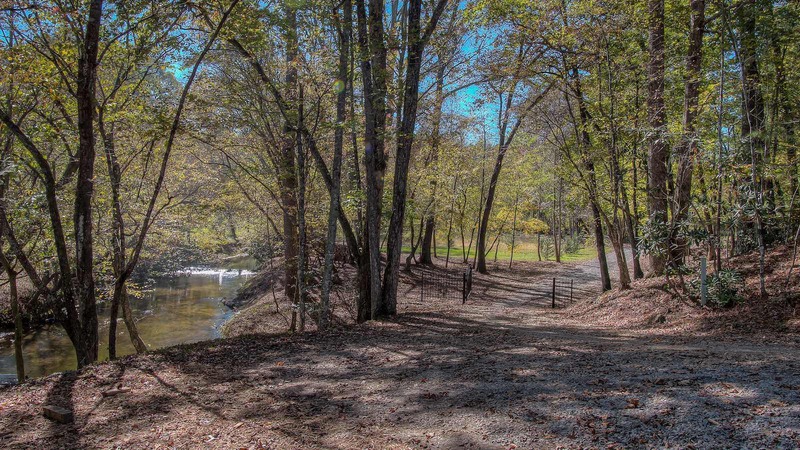 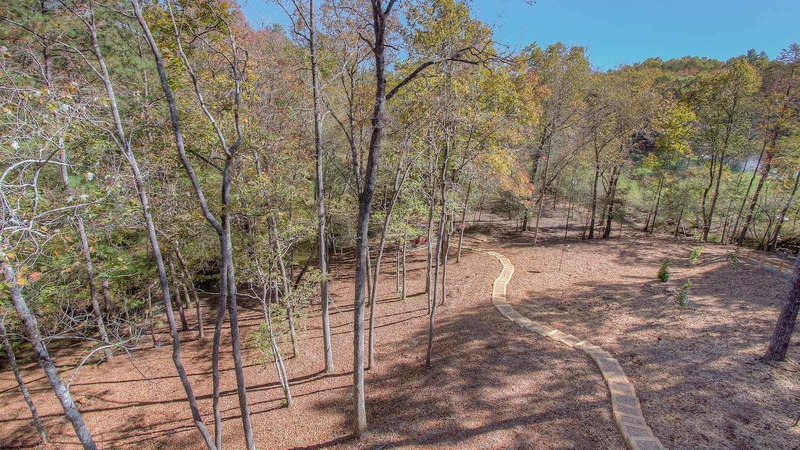 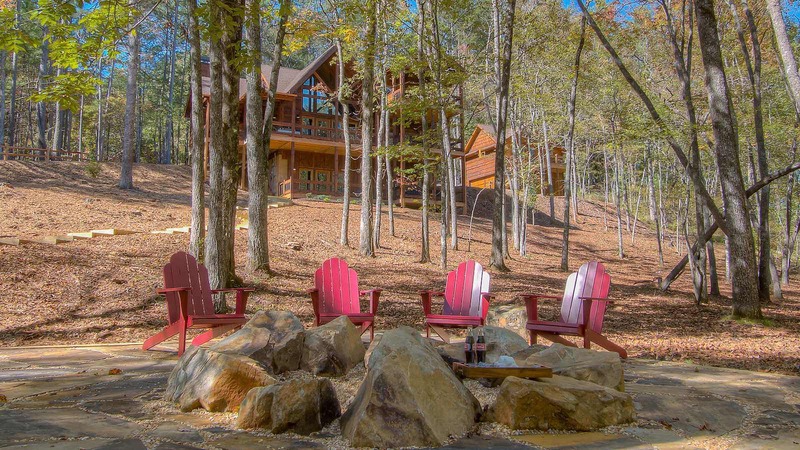 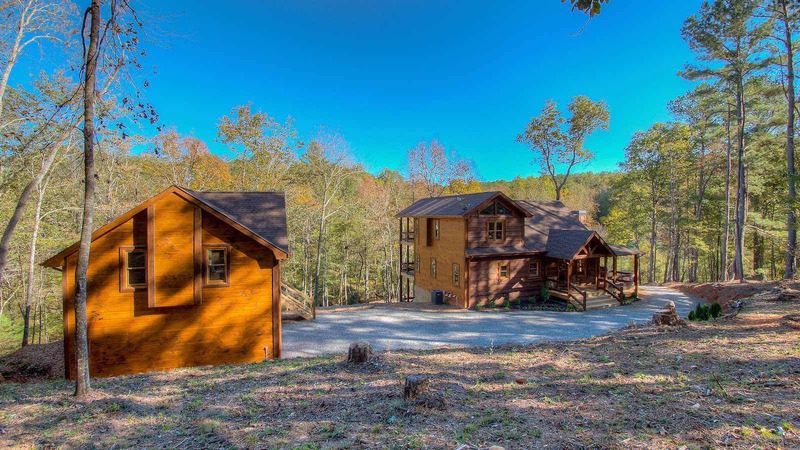 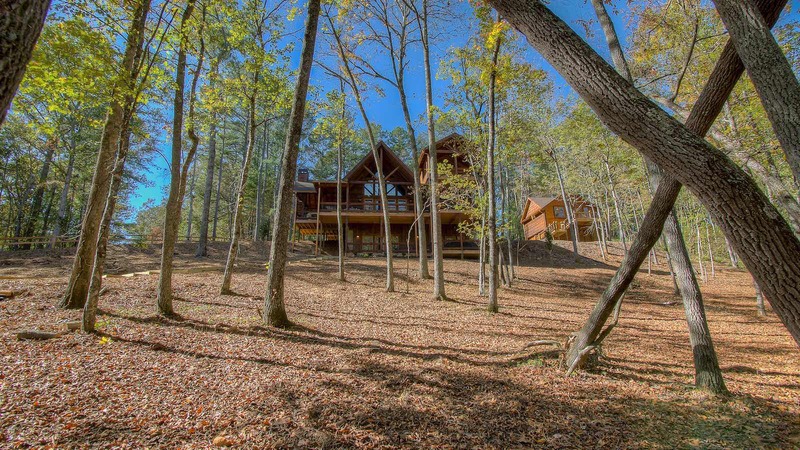 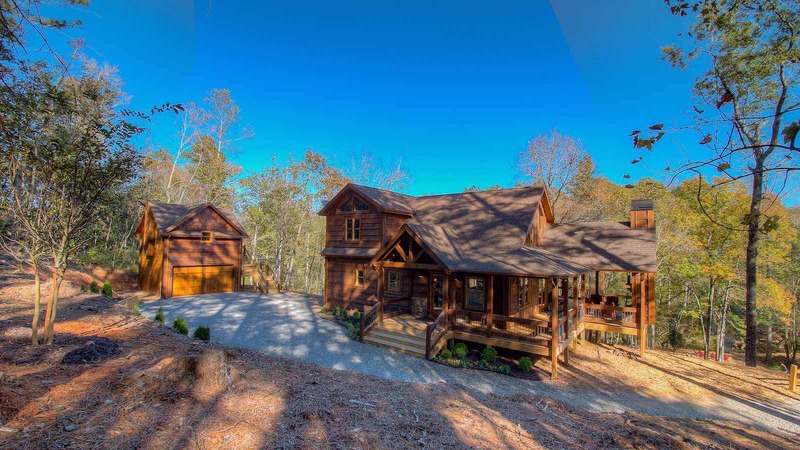 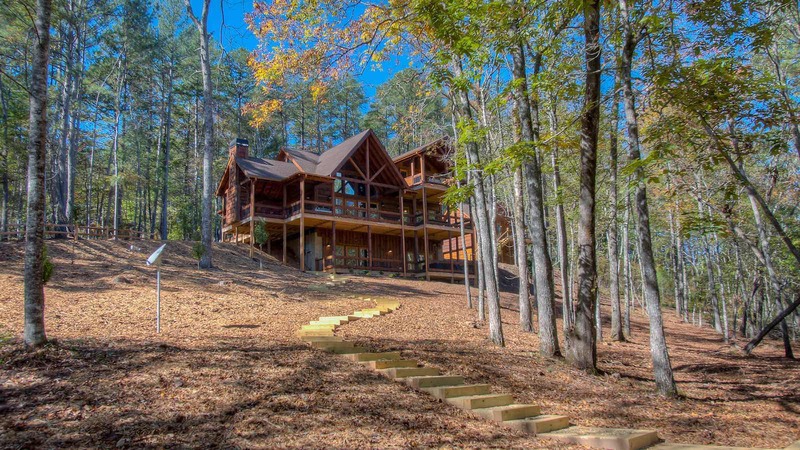 All rock and perfectly placed next to the creek, you’ll be able to spend hours entertaining and enjoying the mountains & water frontage fireside! 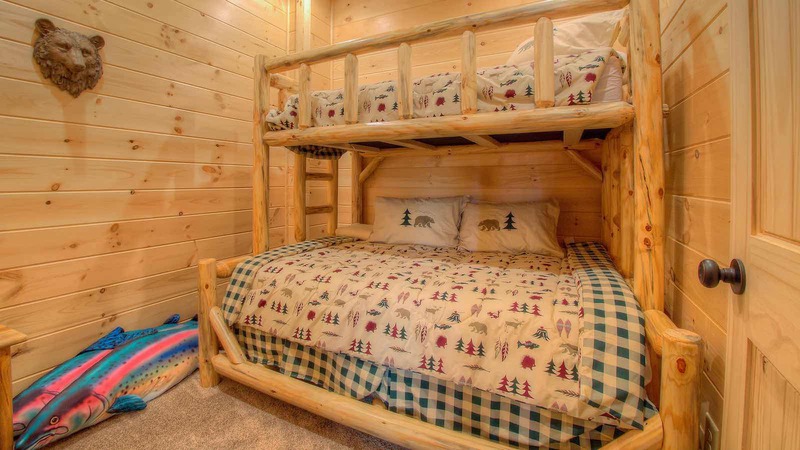 Need one extra bed for up to two guests? 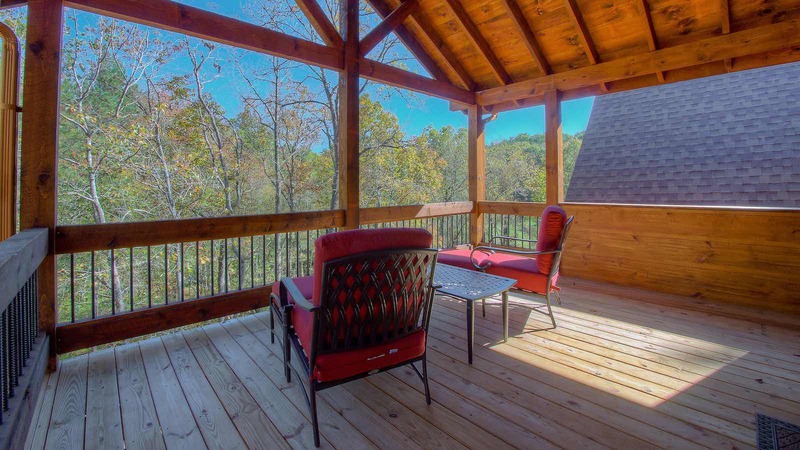 Living Waters has a charming and romantic guest house above the garage with outside stair access and a small deck that overlooks the creek. 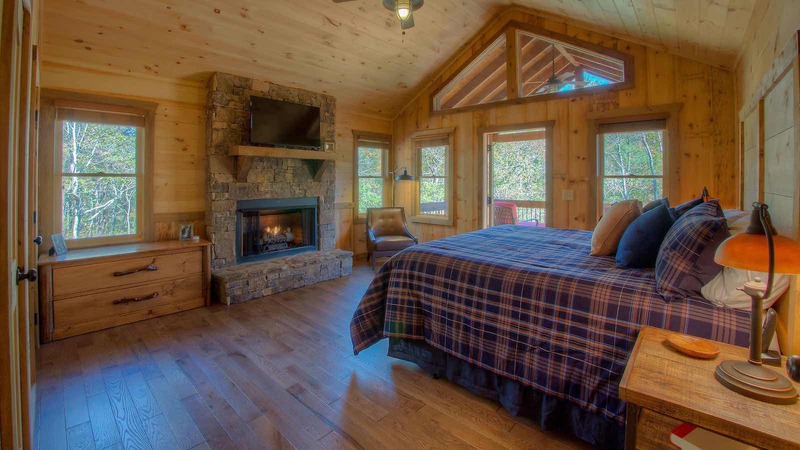 This Studio style space has a King bed, gorgeous full bath, kitchenette, stone fireplace with gas logs, two recliners, large TV and dining table for two inside and one outside overlooking creek. 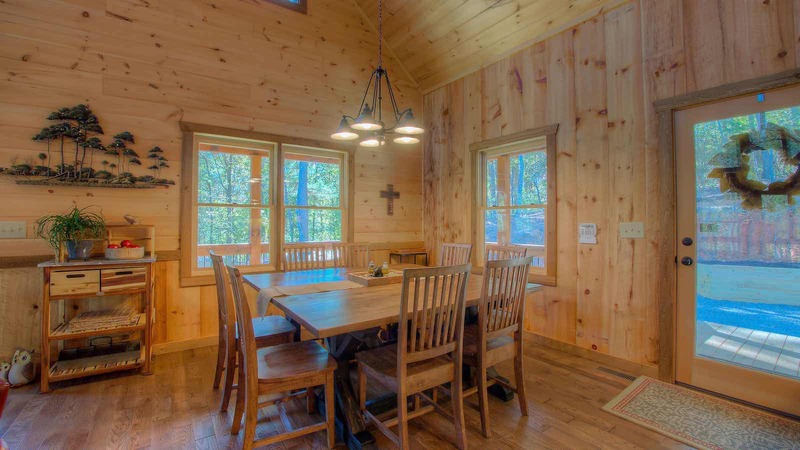 Living Waters will capture your heart and soul, and you will never want to leave! 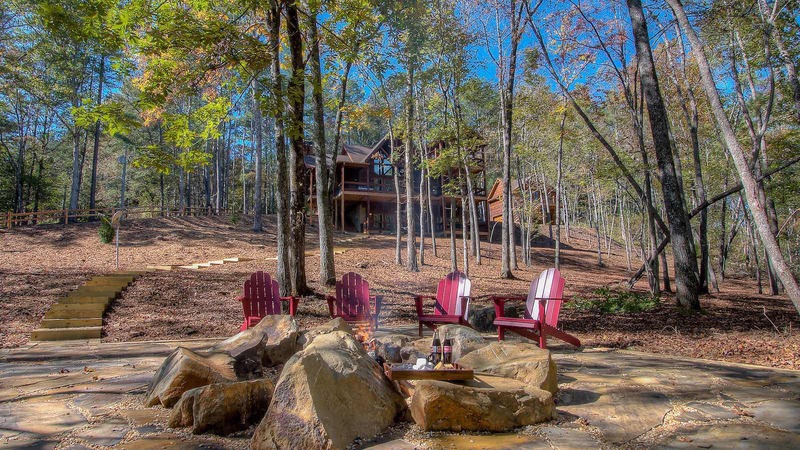 Reserve today and start counting down the days until you get to experience this amazing place! 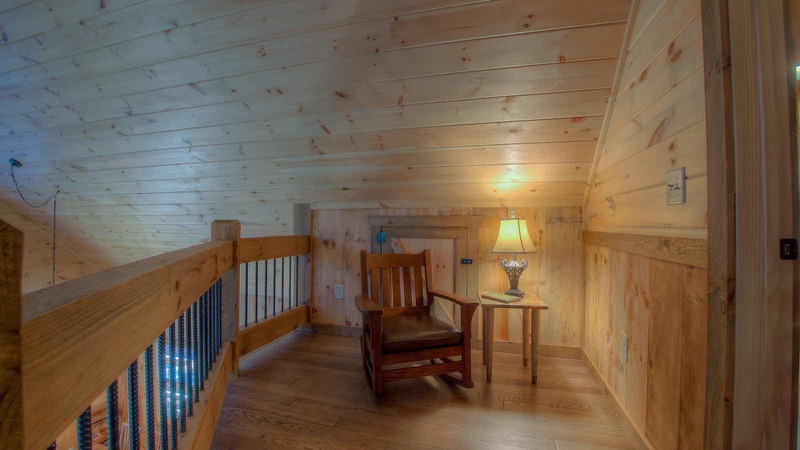 Mother-in-Law Suite is located above the gargage, with separate side entrance up the stairs - garage is not available for guest use. 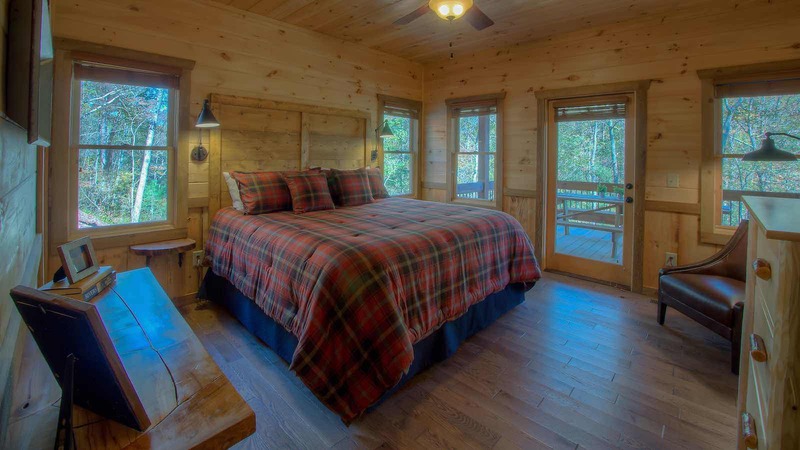 Mothe-In-Law Suite must be reserved with original rental reservation in advance, otherwise it will be locked for duration of stay in main cabin.